Do you understand what I'm saying? is a site-specific installation by artist Gabriel Sosa and organized by A R E A with the support of the Somerville Arts Council. The work explores the imperfections and ambiguities inherent in language and communication. Drawn from his experiences as a court interpreter, the questions printed in vinyl on the glass exude a sense of doubt, power, and intimidation that can be found not only in the court system but in multiple current events, both social and political. On the further wall, the drawings made by hand hint at the more emotional, human experiences at the root of these events - separated, at a distance, and often obscured. The installation is on view at the Inside-Out Gallery, a Somerville Arts Council project, located in the CVS Window in Davis Square. The artist will host a special performance on November 19, 6:30PM. Opening Reception: Oct. 2 | 6-9PM | 120 St James Ave, Boston. A R E A presents a selection of works of geometric abstraction created in Boston today, a field that remains one of the most striking developments in the history of art. The works included in Forms of Expression (painting, sculpture and photography) reveal either a dependance on logic and calculation or manifest an unedited expression of feeling. Each of them are geometric investigations characterized by precise, meticulous and rigorous explorations of form, shape and color. These artists find freedom in the confinement of a form or a shape through a wide range of colors (from primary to seductive neon colors) for expressive effects, giving in some cases a sense of order, and in others, a desire to disrupt unity. Focusing on material and process too, they address issues of complex spatial relationships. This is not just fascination with form. A preoccupation for content links the artists represented here: political conditions, environmental changes, language structures, the human existence or the architecture of raw nature are among the references evoked in the exhibition. interviews, and field recordings by Northampton, Massachusetts-based artist Mark Guglielmo. Curated by David Guerra, it runs from October 6—27, 2017 at Villa Victoria Center for the Arts. 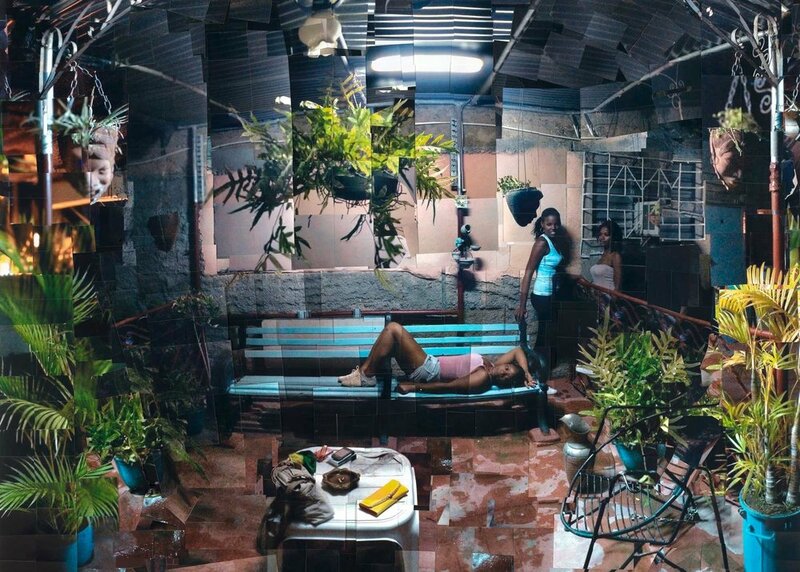 Guglielmo’s images are a record of the ethnic and cultural heterogeneity that characterizes the Cuban people by going beyond what is commonly defined today as Cuban. Cubaneo is the term used in Cuba to refer not to the Cuban identity but to the ways that identity is expressed. Cubaneo then includes all the idiosyncrasies of Cubans including its reflection in Cubans’ unique contemporary language. While access to what’s Cuban may be achieved without even visiting the island, exposure to Cubaneo can only be achieved in Cuba, immersed and surrounded by Cubans. Only then can their behavior, including negative attitudes, their interactions and aspirations, their feelings and ways of being and living reveal itself. These mosaics capture the essence of Cubaneo, leaving behind the foreign and naïve views often used by other photographers looking to depict this island and its people. Artists Gabriel Sosa and Mari Claudia Rodriguez both work closely with family and language to create powerful and intimate videos that explore distance, memory and Cubanidad. Join us on Sunday, January 15, at 3:00 p.m. for a screening of their respective works and a discussion with Gabriel Sosa. Through drawing, sound, and video, Gabriel Sosa integrates his experiences as a court interpreter, translator, and Cuban-American to explore the resilience and fallibility of memory in both the criminal justice system and the reconnection between the Cuban diaspora and those on the island. Born into a Cuban family in Miami, Florida, he is a graduate of the MFA program at the School of the Museum of Fine Arts at Tufts University. Recent exhibitions include The Yud Video Project at the Contemporary Jewish Museum in San Francisco, Drawing Connections at the Museum of Fine Arts, Boston, and SKIN at the Los Angeles Municipal Art Gallery.